Looking for the perfect chicken marinade or steak marinade? Or maybe a vinaigrette or dipping sauce? 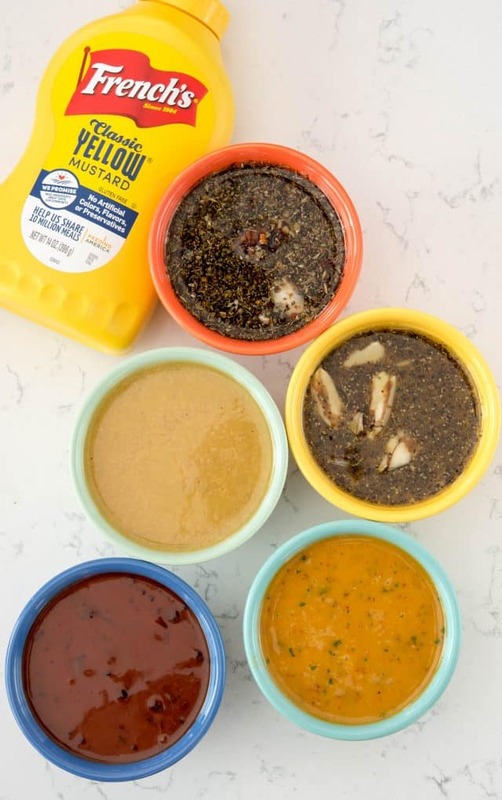 Here are 5 easy recipes and ways to use yellow mustard in dipping sauces, dressings, and marinades, sponsored by French’s. Don’t miss the steak and chicken marinade – they’re standby recipes I’ve been using for 20 years! My husband LOVES mustard; I think it’s his spirit animal. Ever since I’ve known him, mustard is part of his daily life. He puts it on everything, from sandwiches to sausages. He even makes a snack out of a tortilla slathered with mustard on a regular basis! Mustard is such a versatile condiment; it can be used in so many ways! If you’re only putting mustard on your sandwiches, you’re missing out. Besides adding flavor to your hamburgers and hot dogs, mustard is a crucial and delicious ingredient for an array of sauces, marinades, salad dressings, and dips. My favorite tortellini pasta salad uses a homemade balsamic vinaigrette that emulsifies easy because of the mustard. It’s not just for flavor – a lot of times the mustard is the binding force behind a recipe. My go-to mustard brand is French’s. It’s the one Mel prefers, so it’s always in my cabinet. 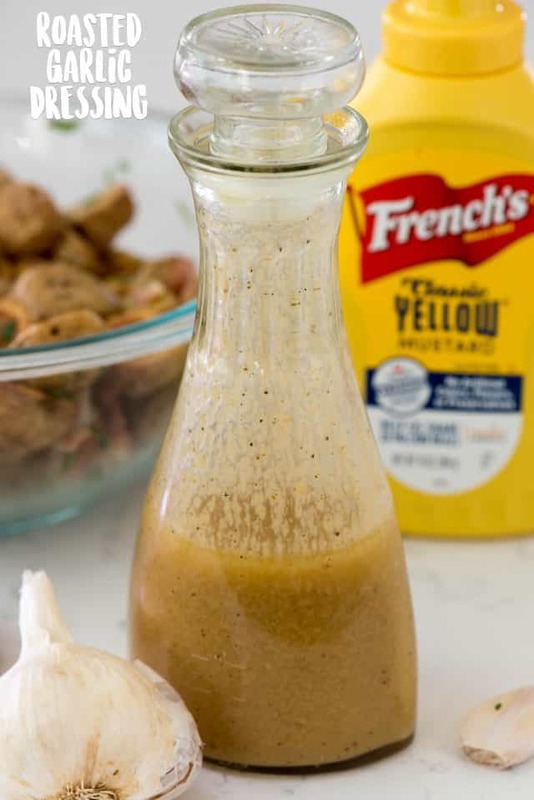 French’s Classic Yellow Mustard is a versatile, go-to condiment to turn any dish into a tangy, flavor packed delight with just a few simple ingredients. One bottle of French’s is all you need to create an array of different sauces and dressings for flavorful summer meals! I’m sharing 5 ways to use French’s Classic Yellow Mustard today. From vinaigrettes to marinade, this post is your one stop shop for using up that bottle of yellow mustard. Many of these recipes do double duty too; use as a salad dressing one day and a marinade or BBQ sauce the next! You can find all the ingredients and recipes, as well as uses for these sauces and dips down in the recipe card. Mustard is such a classic and easy ingredient; learn how to make the best Steak and Chicken Marinade plus 5 recipes for dips and dressings! This dressing is perfect for your summer salads! 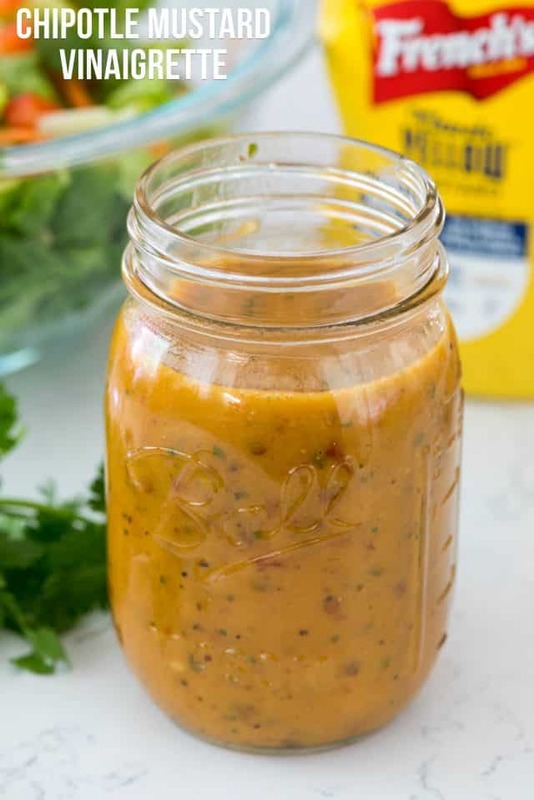 It’s reminiscent of a homemade salad dressing I used to make with lime and chipotle chile peppers, except this version uses mustard for emulsification. Making your own homemade vinaigrette is so easy; I love making them from scratch because I can control the sugar, salt, and vinegar in the recipe. I like thicker dressings, so most store bought ones have too much vinegar for my taste. Making it at home allows me to control what I put in, plus it’s fun to play with flavors. Mustard is a great emulsifier for dressings. It’s something that can make a vinaigrette thick and creamy without adding a creamy ingredient (like mayo). This dressing has a southwestern flair because it uses chipotle chiles in adobo. If you’re not familiar, these chiles come in a can and are soaked in a thick adobo sauce that’s spicy and smokey. You find the cans of these in the Mexican food aisle, near the salsas. One can will last awhile; I often use 2 or 3 in my dressing and then freeze the rest for the next time I’m craving a smokey flavor. We love putting this chipotle mustard vinaigrette on salad or using it to marinate chicken. Either way, it’s a keeper! I don’t know about you, but we eat a lot of chicken. It’s being grilled up at least 3 times a week at my house, so I’m always trying to find new flavors and marinades to use. 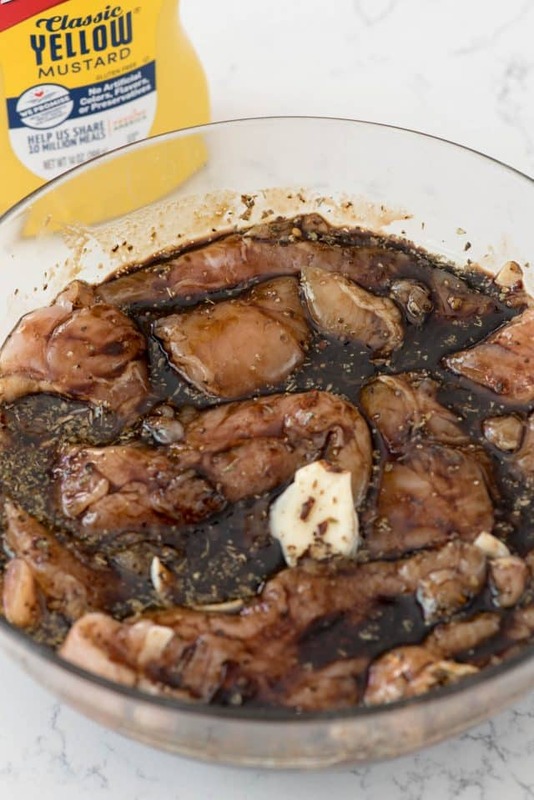 Lemon Chicken is a go-to recipe for me, as is my easy oven baked BBQ chicken, but my #1 go-to chicken marinade is Balsamic. 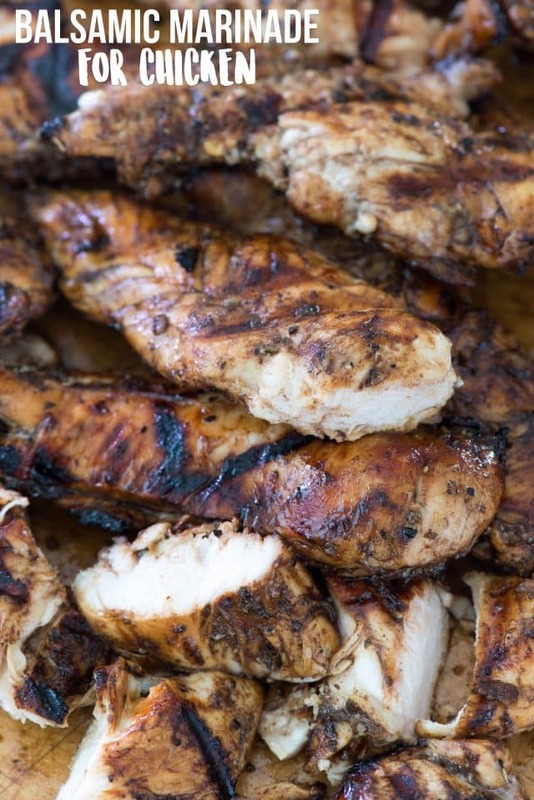 We love balsamic vinegar, especially when mixed with mustard, to coat our chicken for grilling. Now that it’s summer, we grill almost every night of the week, so I’ll be making this easy marinade recipe multiple times a month. Balsamic vinegar is mixed with French’s Classic Yellow Mustard, along with garlic and herbs and spices for a delicious coating for the chicken. Be sure to get a good quality balsamic vinegar; you want to use a good one when the flavor is the main component. Chicken tenders are my favorite chicken to grill, because they cook fast and never get dry. You can also use this on regular chicken breasts or thighs. Just make sure to marinade the chicken for at least 4 hours before cooking. Grilled chicken tip: if you’re using full breasts, either slice them in half so they are similar sized all around or pound them with a mallet or rolling pin to make them evenly sized. This makes the cook time even so there won’t be any dry spots! I have been using this steak marinade for years. I think I found a version of it in an old cookbook about 20 years ago and I’ve been tweaking it and using it ever since. We try not to eat red meat more than once a week, but steak really is my favorite. My absolute favorite cuts of beef are skirt steak and flank steak. Both of them are fantastic with this marinade. I’ve even had people come up to my front door asking what I’m cooking when I grill with this marinade! It may seem like a lot of ingredients, but this recipe is worth it. It gives an extra dimension of flavor to the meat. What’s in the best steak marinade? I know the different flavors might seem weird (steak sauce with teriyaki?) but they actually make so much sense once you taste it. Once you marinate your steak for at least 4 hours, just grill like you normally would. For skirt steak, we only cook it about 3-5 minutes on each side for medium rare. This roasted garlic dressing is good for so many things! First of all, let’s talk about roasted garlic. Have you ever tried it? One of my favorite things to do with garlic is to roast it and then spread the soft roasted cloves onto french bread. The flavor of roasted garlic is so heavenly – roasting cuts the harshness of the garlic. It gets soft, almost like whipped butter, and is great for mixing into mashed potatoes or putting on bread. Of course, roasted garlic is also amazing in salad dressing. Combined with yellow mustard for body, the flavor of this dressing is out of this world. Mel tried all of these recipes and this Roasted Garlic Dressing was by far his favorite. It’s actually really easy. Just slice off the top of the head of garlic so that the cloves are exposed. Drizzle with oil and wrap in foil, then bake or grill until it’s soft. Once it cools a bit and you can handle it, you just squeeze all the roasted garlic out of the peels. For the dressing, you then blend it with mustard, vinegar, oil, and spices for a fantastic vinaigrette. It’s perfect on salad or even as a chicken marinade, but I love making roasted potato salad with it. Neither Mel nor I are huge mayo fans, so we usually skip traditional potato salad. We prefer potato salads without mayo; that is, made with a vinaigrette instead. 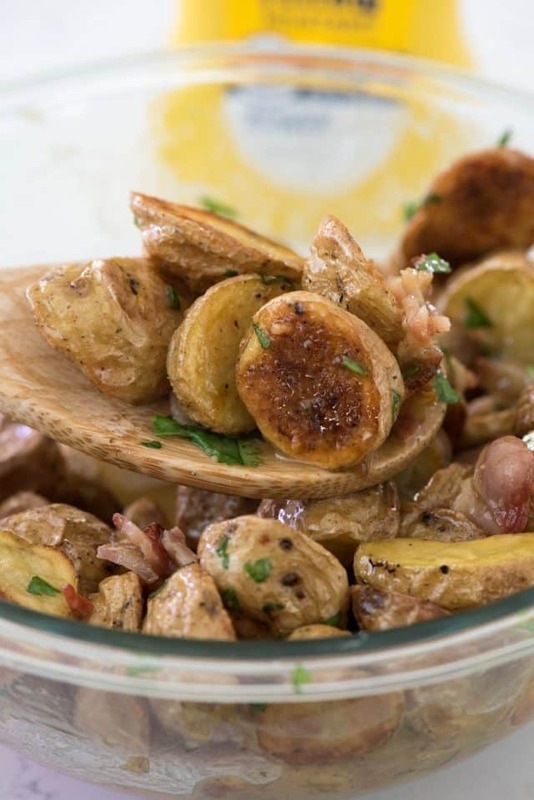 Roasted garlic is heaven on potatoes, so when combined with a roasted baby yellow potato, bacon, and cilantro, you get a new twist on an old favorite salad recipe. 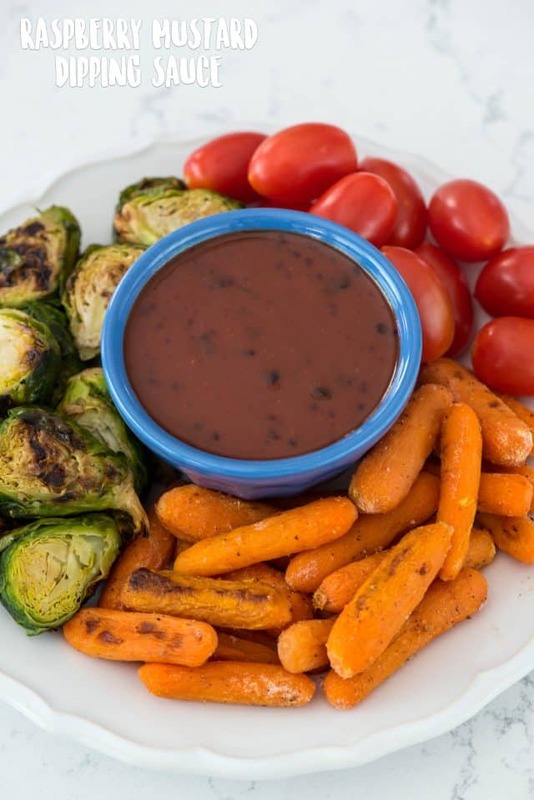 If you’re looking for an easy dipping sauce for fresh or roasted veggies, this raspberry mustard dip is it! It’s easy to make by just stirring raspberry jam and French’s Classic Yellow Mustard together with a bit of honey. If you’re making a crudité platter or a charcuterie board, this easy dip would be a great addition. Besides dip, it’s also great as a glaze on grilled chicken. Simply brush it on during grilling, like you would a BBQ sauce. It adds a heavenly sweet and smokey flavor! These 5 easy recipes for yellow mustard should get you through your summer. Do you have other ways you like to use classic yellow mustard? Let me know in the comments! Looking for the perfect chicken marinade or steak marinade? Or maybe a vinaigrette or dipping sauce? Here are 5 easy recipes and ways to use yellow mustard in dipping sauces, dressings, and marinades! Place all ingredients in a food processor or blender. Blend until smooth. Add additional salt or pepper to taste (optional). Store in a jar or sealed container in the refrigerator. Shake before using. Uses: salad dressing or marinade for chicken or steak. 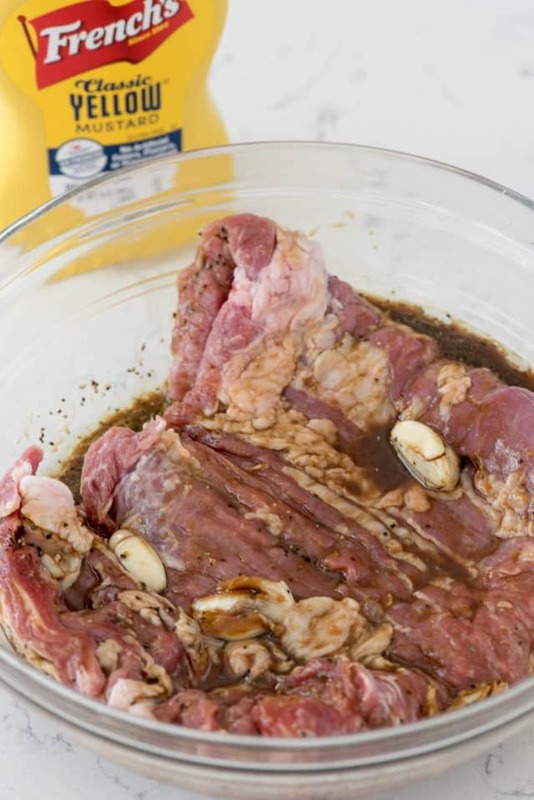 To use as a marinade: coat meat and let marinate for at least 4 hours. Whisk together all ingredients in a measuring cup. To use: pour marinade over 1 pound chicken breasts or tenders. Make sure all your chicken is about the same size for even cooking. Let marinate for at least 4 hours in refrigerator. To cook: heat grill to medium high heat. Grill until meat is no longer pink. Let rest for 10 minutes before slicing and serving. 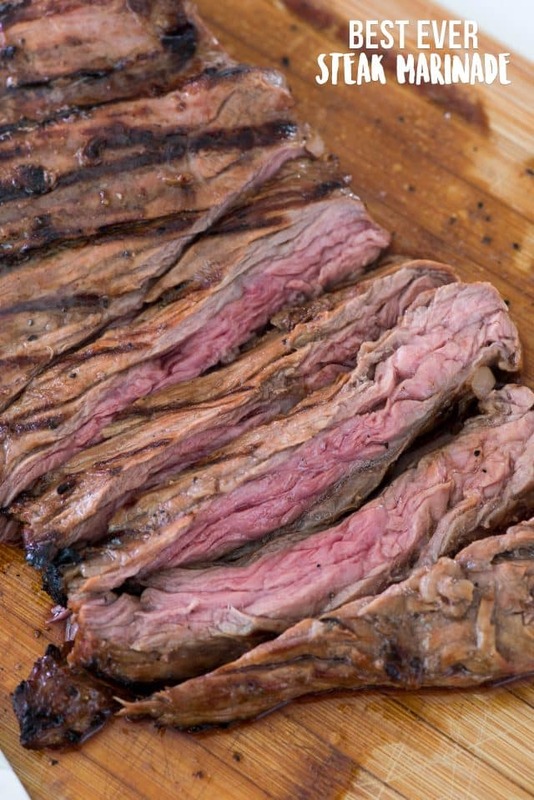 To use: pour marinade over 1 pound steak (such as skirt steak, London broil, or flank steak). To grill: preheat grill to medium high heat. Sear the meat on each side, cooking until desired doneness. For skirt steak, cook 3-5 minutes per side for medium rare to medium. Roast your garlic: preheat oven to 400°F. Slice off just the top of the garlic so the cloves are all exposed. Place on a square of foil and top with 1 tablespoon olive oil. Wrap tightly and bake 25-40 minutes, or until soft. Let cool at least 20 minutes. Carefully squeeze the garlic cloves out of the peels into a blender or food processor. Add remaining 1/2 cup olive oil and remaining ingredients. Blend until smooth. Add more salt or pepper to taste. Uses: perfect for salad or a mayo-free potato salad! To make Roasted Potato Salad: slice 1 pound of washed baby yellow potatoes in half. Place on a greased cookie sheet. Toss with olive oil, salt, and pepper. Roast at 400°F for about 30 minutes, stirring occasionally. Place in serving bowl. Cool 20 minutes. Meanwhile, cook 4 slices bacon until crisp. Drain and crumble. Chop a handful of cilantro or flat-leaf parsley. Mix potatoes, cilantro, and bacon in serving bowl and toss with dressing. Store in refrigerator. Mix all ingredients in serving bowl. Store in refrigerator. Uses: great for dipping vegetables, roasted or raw. Put on a veggie tray at parties, or use for dipping pretzels. Can also be used as a glaze for grilled chicken! This post has been sponsored by French’s Classic Yellow Mustard. All opinions are 100% my own. These all look incredible! I recently did a similar post and I love all your creative ideas. Especially the raspberry one! I want that now! These all look amazing – I have definitely been missing out on using mustard, I just kind of skip over it! Can’t wait to try these — and thanks for the tip on how to roast the garlic, that’s something that’s always kind of intimidated me! And the best part is that mustard has no calories to add.